what we were trying to get to. 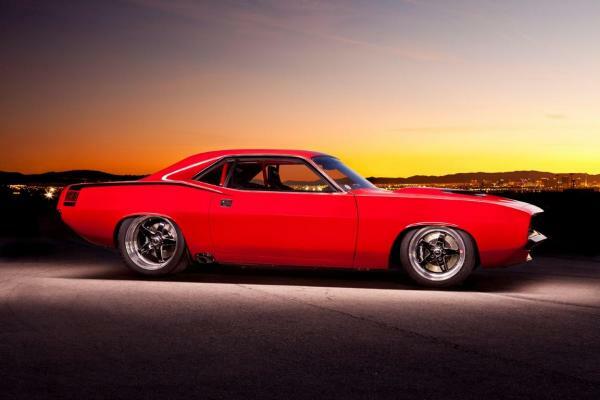 We had the honor of building this amazing 1970 Plymouth Cuda for the owner of Mcleod Clutches. We picked up the shell of a Cuda and an Art Morrison chassis from Mcleod to start this build. The Chassis is actually the first Mopar E-body chassis they constructed. The body had seen better days. It was hit from both ends and had some rust issues as well. We mated the body to the chassis and started with panel replacement. We ended up needing to replace every panel except for the hood. We constructed a full cage to help stiffen up the car as we knew the power level was going to be excessive. Arrington Performance built an all aluminum 528 Gen II Hemi for it. It features a Mopar block, the new Edelbrock Hemi heads, Comp cams valve train, Holley EFI, ProCharger supercharger, and a host of other top brand items. It made 1140 hp on Arrington's dyno on 93 octane fed by a full Aeromotive fuel system. It is backed by a Tremec tko-600 trans, with a Mcleod RXT twin disc clutch and hydraulic t.o. bearing. A 9" rear with 3.89 gears got the nod for the rear. It rides on Ridetech coil overs. 18" front and 20" rear. Weld RTS S71 wheels and Mickey Thompson tires make up the rolling stock. Wilwood 14" brakes along with a Hydratech brake assist unit provide more than ample braking. The interior is on the sparse side. The dash is a RacePak rdx module. Painless wiring was used throughout. Vintage Air will make road trips a little more tolerable, while the Corbeau seats and Crow safety belts keep you where you belong. The interior panels are wrapped in black suede with carbon accents. The body underwent many mild modifications to help smooth and streamline. One of the requests was we had to keep the original "two scoop hood", which we did after raising the back of it 3" for engine clearance. We painted it in house using PPG waterborne paint.